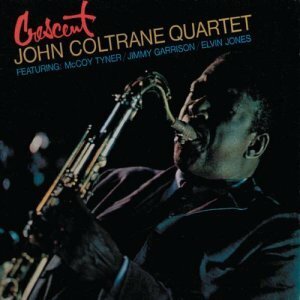 John Coltrane's Crescent from the spring of 1964 is an epic album, showing his meditative side that would serve as a perfect prelude to his immortal work A Love Supreme. His finest quartet with McCoy Tyner, Jimmy Garrison, and Elvin Jones supports the somewhat softer side of Coltrane, and while not completely in ballad style, the focus and accessible tone of this recording work wonders for anyone willing to sit back and let this music enrich and wash over you. While not quite at the "sheets of sound" unfettered music he would make before his passing in 1967, there are hints of this group stretching out in restrained dynamics, playing as lovely a progressive jazz as heard anywhere in any time period. The highlights come at the top with the reverent, ruminating, and free ballad "Crescent," with a patient Coltrane acquiescing to swinging, while the utterly beautiful "Wise One" is accented by the delicate and chime-like musings of Tyner with a deeply hued tenor from Coltrane unrushed even in a slight Latin rhythm. These are the ultimate spiritual songs, and ultimately two of the greatest in Coltrane's storied career. But "Bessie's Blues" and "Lonnie's Lament" are just as revered in the sense that they are covered by jazz musicians worldwide, the former a hard bop wonder with a classic short repeat chorus, the latter one of the most somber, sad jazz ballad reflections in a world full of injustice and unfairness -- the ultimate eulogy. Garrison and especially Jones are put through their emotional paces, but on the finale "The Drum Thing," the African-like tom-tom sounds extracted by Jones with Coltrane's sighing tenor, followed by some truly amazing case study-frantic snare drumming, makes it one to be revisited. In the liner notes, a quote from Leroi Jones/Amiri Baraka states John Coltrane was "daringly human," and no better example of this quality transferred to musical endeavor is available than on this definitive, must have album that encompasses all that he was and eventually would become.